It turns out that the final levels shed the halloween motif pretty quickly and settle into something more like the knightly stuff I was expecting. Not that this has a very great effect on on the game — the monsters are the same as always, and not even reskinned. But the ultimate goal is the Holy Grail (which helps you get a spaceship somehow), and the final boss is a gray-robed wizard-looking guy, albeit one who’s 80 feet tall according to the stats provided in-game. His schtick is that he summons random assortments of the standard monsters, which makes for a difficult fight until you find out about the cheap trick that lets you take him down with near absolute safety. 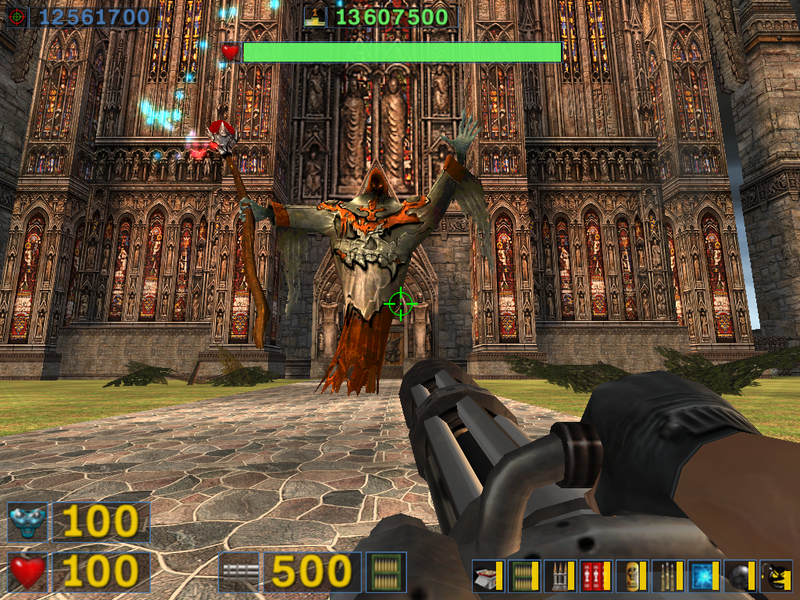 Something of a letdown, but then, the end boss in Serious Sam: The First Encounter is a really tough act to follow. Looking back on the whole game, how would I describe it? Oddly medatative. 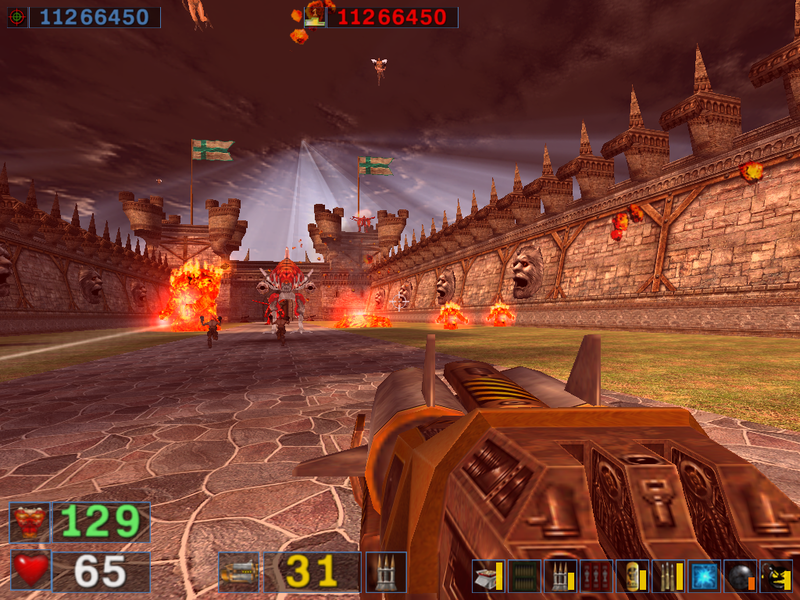 The bulk of the player’s time is spent on chaotic battles in open areas, which is the kind of action that mainly engages the lower brain functions, leaving the player’s thoughts free to wander. Sometimes this means I was thinking about tactics — deciding which weapon to use, whether to seek cover, and so forth — but by the end, I had pretty much got that down. There are only so many permutations the game supports, and by the end, you’ve seen them all several times. I suppose most FPSes deal with this by varying the environment a lot, adding in puzzles and platformer sections if necessary. But Sam, especially toward the end, mainly plays to its strength: chaotic battles in large, open environments. So, do I want to continue on to Serious Sam 2? Maybe, eventually. There are other FPS games on the Stack, and a distinct possibility that I’ll be sick of them before I get through them all. I’m about halfway through the final level now, having finished the biggest, most elaborate courtyard battle yet, with close to 500 monsters of every kind. At one point Sam says “Never underestimate the power of stupid things in large numbers.” It could be the game’s motto. There were basically two pauses in this battle where I needed to advance to the next location trigger before more enemies would spawn. (Presumably trying to just run to the end would activate them all at once.) Naturally I saved at these junctures, but in such a long stretch of peril, just two saves wasn’t nearly enough for me. So I wound up using the quicksave key a lot in the middle of dodging fire. Now, I don’t like doing this. Not only does it split up the action and draw away from the flow, it’s just too risky: fairly often, you wind up quicksaving a split-second before something kills you from behind. 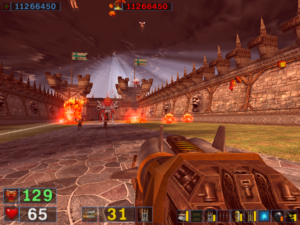 But Serious Sam has a nice way around that: instead of just one quicksave slot, it has eight, cycling to the next one on every save. The quickload button always loads the most recent quicksave, but you can access all eight from the main menu, so occasional bad timing doesn’t hurt so much. I think this is a sign that the designers had mid-fight quicksaving in mind, that they consider it okay. There’s sort of an implicit bargain there: we get authorial permission to engage in behavior that’s considered borderline cheating by many, and in return the designers get our permission to put us through really long unrelieved action sequences. The third segment of Serious Sam: The Second Encounter takes place around a bunch of castles in eastern Europe. I knew when I got the game that there was a section with European castles, and I expected it to be presented in the usual vaguely-chivalric fantasy vein. But no, this is Eastern Europe 1 Exactly where in Eastern Europe is unspecified. But he year is given as 1138 AD, which probably means it’s in modern-day Thxylvania or something. , which has a whole different set of tropes. The styling goes dark and gothic, and the background music turns into stereotypical old-fashioned B-movie creepshow stuff. How stereotypical? It’s based on the exact same four-note organ motif as the theme to Buffy. A funny thing about the music in this game: it’s tied to the intensity of the action. 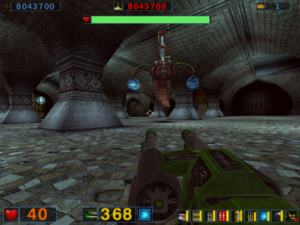 I think each level has three main pieces of background music (excluding special areas with their own music): a sedate and almost ambient one for solitary unmolested exploration, a more uptempo one with more instruments for minor encounters, and one with electric guitars added for pitched battles. The funny thing about this is that the background music actually gives you information. Sometimes your first clue that you’re being attacked is that the music kicked up a gear. Likewise, when you’re finishing a battle, you can tell by the music when you’ve downed the last foe. It reminds me of Jaws (or rather, since I haven’t actually seen Jaws, it reminds me of the jokes about Jaws), how the shark’s presence was always signalled by the soundtrack before you saw it. But usually, in a movie, only the audience is aware of the soundtrack, so there’s no chance that the hero will notice the monster theme and react to it. In my hands, Sam varies his behavior in response to the music all the time. 1. ↑ Exactly where in Eastern Europe is unspecified. But he year is given as 1138 AD, which probably means it’s in modern-day Thxylvania or something. Another day, another insanely difficult boss monster. 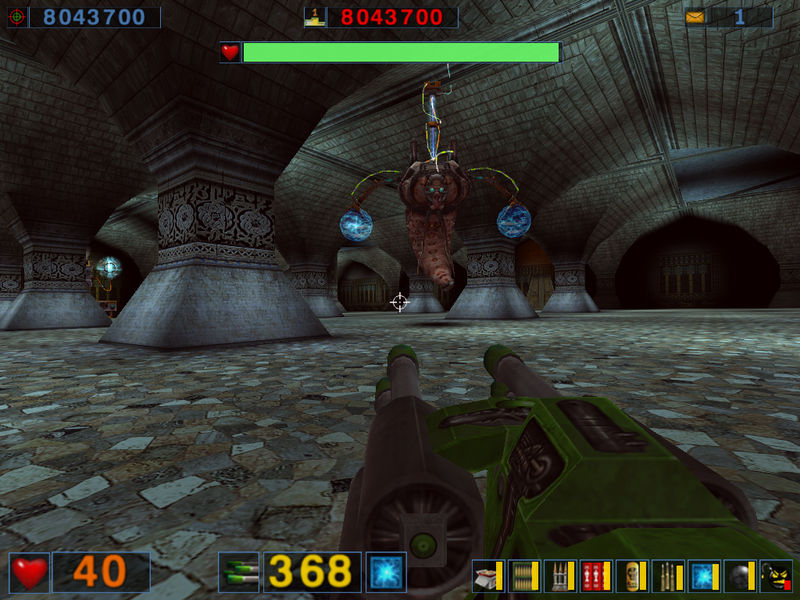 The Babylon segment of Serious Sam: The Second Encounter ends in a fight with a colossal cyborg insect larva that hangs from a track in the ceiling and moves like a rook on a chessboard, firing energy blasts and emitting small explosive offspring. It’s got enough hit points that I quickly ran out of the ammo for the best weapons while fighting it — there are some ammo packs that spawn during the fight, but getting them involves taking your attention away from the monster, which is risky. So I wound up using most of my weapons against it (with the exception of the hand-to-hand weapons, the knife and the chainsaw, which are useless here — and nearly everywhere else). 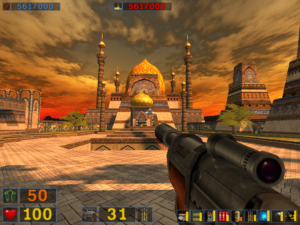 The weapons in Serious Sam mainly follow the standards laid down by Doom and followed by countless FPS games: chainsaw, pistol, shotgun, machine gun, rocket launcher, grenade launcher, energy weapon. The BFG is replaced by “serious bombs”: like classical videogame smart bombs, they kill everything in the area except the player and certain boss monsters. This isn’t as useful as it sounds, because you can only carry three at once, and the toughest battles in this game have more than three waves of monsters. Add to this set the sniper rifle, the flame thrower, and the SBC cannon. 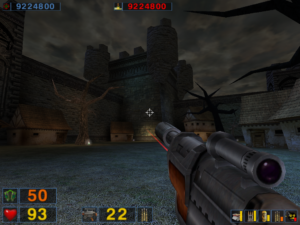 It’s strange to think that there wasn’t a sniper rifle in Doom or even Quake — today, it seems like one of the basic ubiquitous FPS weapon types, just as much as the shotgun. I wonder if there are any more basic weapon types that haven’t been discovered yet? Things that fill a genuinely new gameplay niche, I mean, and aren’t just gimmicks. It seems like there’s been less innovation there than for weapons in non-FPS games. 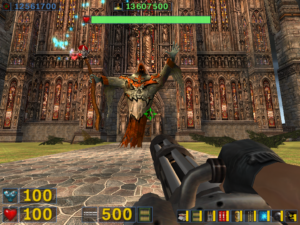 Duke Nukem gave us bombs that you could lay as traps, and Unreal gave us projectiles that bounce off walls, but those are basically just extensions of what’s implicit in Quake‘s grenade launcher. 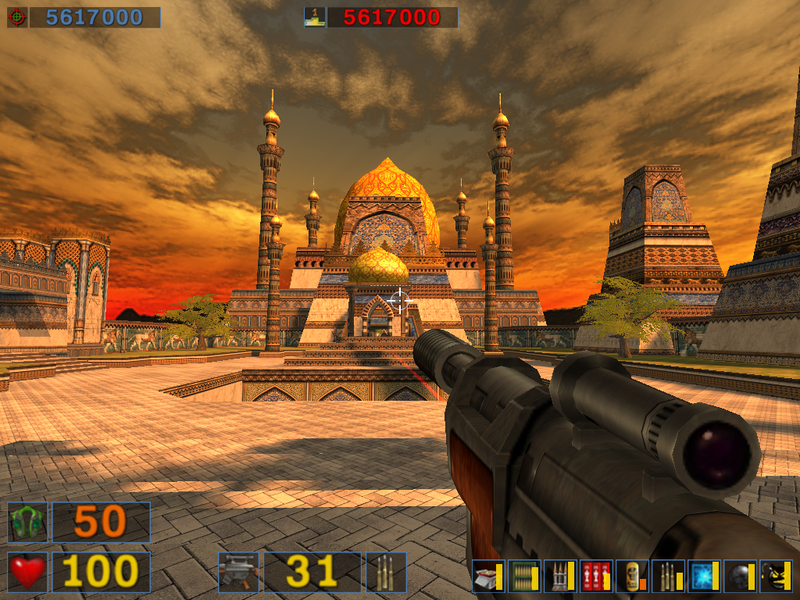 Getting back to Serious Sam for a bit, I’m stuck by how easy it is to get into, at least in comparison to other things I’ve been playing lately. The controls are simple, but more significantly, they’re ingrained. They’re more or less the same cotnrols I’ve used for every first-person shooter since Quake (with some variation in what the right mouse button is used for). This is stuff I doubt I’ll ever forget how to do. It’s like riding an extremely violent bicycle. I’ve covered about two levels of the game today, starting somewhere in the middle of level 6 and ending somewhere in the middle of level 8, heading through Persepolis to the Tower of Babel. (Again I remind you to not even bother trying to make sense of this in terms of real-world history or geography. The aliens have removed the entire area from normal time and space or something.) I’m noticing a repeated pattern of tension and resolution here. You start relaxed: you’re in a room without enemies, probably with a bunch of health and ammo items. Venturing forth, you enter a large outdoor area with some distant monsters charging at you or firing at you. More will spawn as you hit trigger points within the area, so it’s best to take it slow: take down the hostiles, advance, repeat. Eventually, your way is blocked by a locked door. In order to open it, you need to go to one or two side areas, which are similar open spaces containing small structures with key items or levers or something of the sort to open the door, together with a bunch of ammo. There’s some apprehension about this, because you know that activating it will also cause a bunch of new monsters to spawn in the area you’ve just crossed, and you’ve got a moderately tough battle ahead of you. After a while, though, you make it back to that door and into some hallways. The tension kicks up a notch: you can’t see things coming from far away, and there isn’t a lot of room to dodge, so you need to be more on-the-ball than you were outside. There may not be any large battles, but there are lots of little surprises, and every Kleer Skeleton that leaps at you from the side when you go through a doorway will take a noticable chunk of health off. Finally, you get to the big fight for the area, wave after wave of increasingly-powerful enemies in a room you can’t exit until you’re the last thing standing. Your reward for victory is access to a room with a bunch of health and ammo and no enemies. And the cycle begins anew. 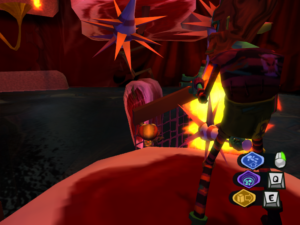 The final level of Psychonauts is called “Meat Circus”, a fusion of the inner landscapes of Raz, whose father is a circus acrobat (explaining where he gets his platforming skills from in true Schafer fashion), and another character whose father is a butcher. Now, most of the things I had heard about this game in advance were positive, but this is the one segment that I had heard complaints about. “Too hard” was the consensus. One person described giving up at this point despite being nearly finished with the game. 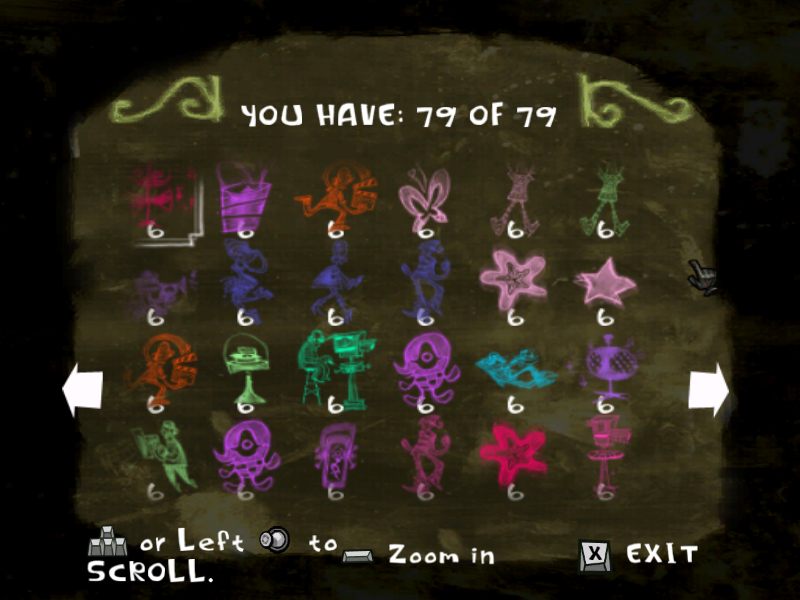 Having played it now, I can assert that it isn’t even the entirety of the Meat Circus that’s so hard. It’s one particular segment of it, in a section where you have to keep climbing faster than a steadily-rising water level: a part that involves jumping between a series of curved segments of climbable mesh, partly on fire. I spent some time unable to clear the second gap at all, until I hit on an approach that turned it from seemingly impossible to merely difficult. The mesh pieces basically form a cylinder, and you leap onto this cylinder from the outside, but jumping from piece to piece turns out to be much easier if you can do it from the inside. It’s tricky to get there, and once you’re there a large part of the view is blocked by the level boss (Raz’s father, or rather, Raz’s fear of his father), but it’s still the easier approach. Talking about it with others afterwards, it seems I’m the only one who did it this way. So apparently it is, in fact, possible to make all the jumps on the outside, but I seriously wonder if the level designer intended it to be possible. One really nice thing about the final world is the way that it ties together and explains some of the things that you saw on previous levels, things that just seemed like dreamlike randomness at the time but turn out to reflect a backstory that you didn’t know yet. It reminds me a little of the Silent Hill games in that respect, except with cartoonish zaniness replacing the creeping sense of dread and unease. The Human Mind: 600 miles of synaptic fiber, five and a half ounces of cranial fluid, 1500 grams of complex neural matter… a three-pound pile of dreams. Frankly, I find it hard to play Psychonauts without thinking of the Ratchet & Clank games. I suppose that they’re both basically just swimming in the general soup of 3D platformers, all of which imitate each other to some degree, but there are a few specific aspects that seem particularly Ratchettian. There’s the general approach to combat sequences: in most cases, battles can be won by either having skill and good reflexes, or by assessing the situation and choosing the one weapon in your arsenal that makes it easy. 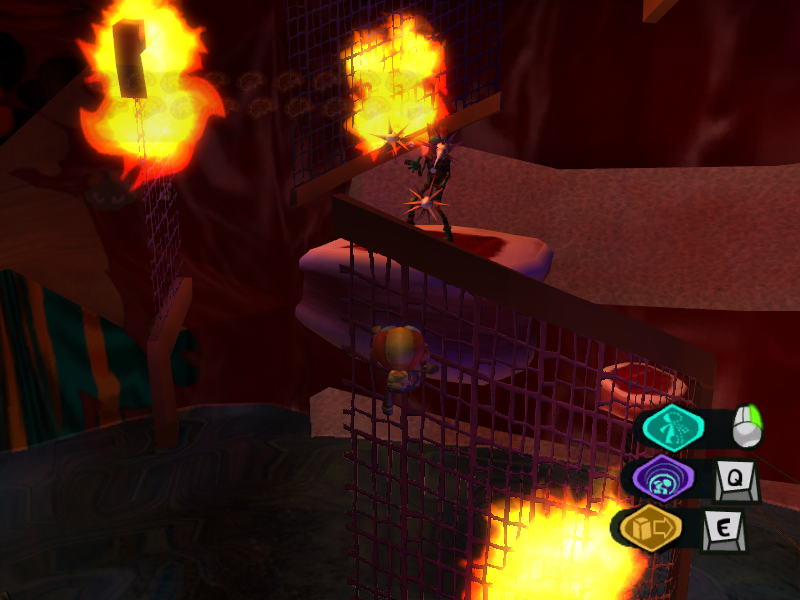 There’s the sliding-along-a-rail sequences, although the two games approach that in different ways: R&C made the “shredding” into something set apart in special areas that demanded tricky sequences of timed jumps, and while Psychonauts has a couple of bits that seem to be intended to evoke the same experience (but aren’t as difficult), it mainly just adds the rails to bits of the regular terrain, letting you slide down bannisters as an alternative to walking down the stairs and the like. And then there’s the pie menus. This is the main thing that keeps reminding me of R&C, because it’s something I use all the time. 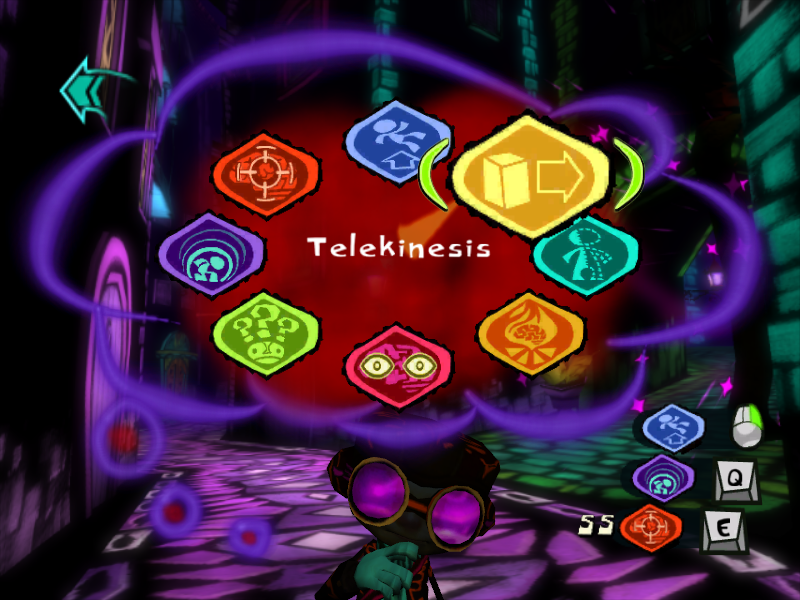 If you want to select a psychic power or an inventory item in Psychonauts, or a weapon or gadget in Ratchet & Clank, you can do it through an interface that shows eight choices in a circle, from which you select one by pointing the analog stick in the appropriate direction. 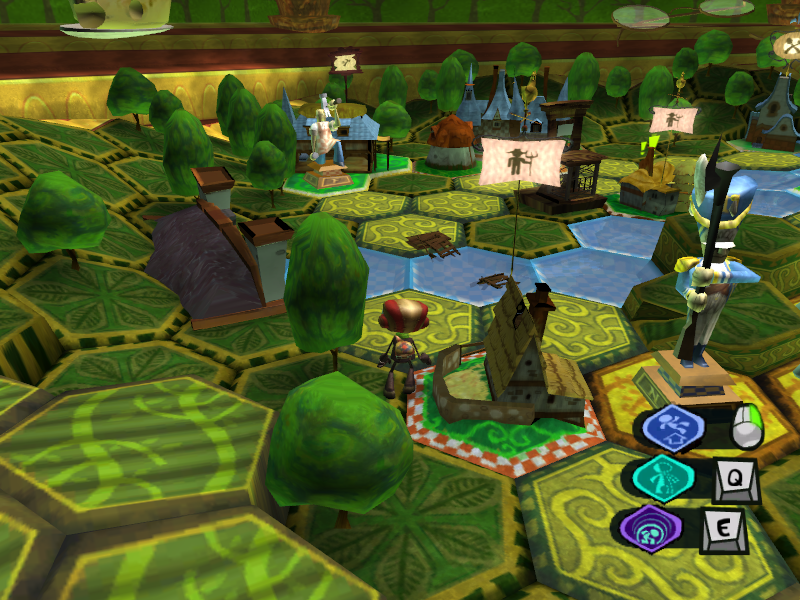 This is one of R&C‘s most distinctive features, and the menu in Psychonauts resembles it more strongly than other pie menus I’ve seen (such as the one in The Sims), which tend to be based on using a mouse rather than a joystick, and have a variable number of slots rather than always eight (resulting in, for example, a triangular configuration if there are only three options). And the strange thing is that, even though this resemblance is strong, it’s very superficial. See, the point of the pie menu in Ratchet & Clank is that it was your quick-selection option. That game had a lot more than eight weapons, and the pie menu wasn’t the primary way to select them. You always had the option of opening up the screen that had the full set displayed in a grid, pushing a cursor around to select the correct square, and resuming the game. But if you were using a particular item a lot, it was more convenient to put it into one of the eight quick-selection slots where you could just press a button, flick the joystick, and release. In the sequels, bringing up the circle menu didn’t even pause the action. Crucial to the way it worked was that you could assign which item went in which slot yourself. If you got used to flicking upward for your main weapon, and then decided to switch to using some other weapon as your main one, you could just replace it. This conceptual niche, the user-assignable quick-selection option, exists in Psychonauts, but not through the circle menu. Rather, the game lets you assign three different psychic powers to different buttons — on a gamepad, keyboard, or mouse — while a fourth button activates the currently-selected inventory item. That’s your quick-selection: selecting which button to press. The pie menu, then, takes the role of that page with the complete grid in R&C. There are exactly eight psychic powers, so they all fit on the same circle, and you can’t alter their positions on it. 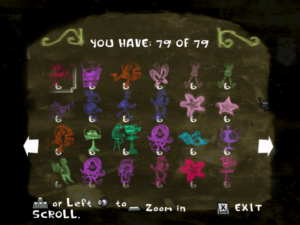 There are sometimes more than eight inventory items, in which case the game lets you page between multiple batches of eight. It really seems like this aspect of the user interface was decided on because it was cool, not because it was appropriate. It’s a menu in which you don’t use any particular option frequently (because the powers you use frequently are the ones you never remove from their button assignments), that isn’t user-alterable, and which, in the case of the inventory menu, sometimes changes itself spontaneously. All of which means it loses the chief advantage of the pie menu: its “gestural” nature, the ability to use it from muscle memory. It might as well be a traditional list. One thing I like a lot about Psychonauts is its variability of style. Each mental world is a representation of one character’s mind, and conforms to that character’s world view, with greater or lesser degrees of abstraction and phantasmagoria mixed in. One person has decided to treat life as an endless party, and has a mind decorated like a discotheque. Another is paranoid, and has a mental landscape that’s fragmented into disjointed sidewalks floating in the abyss in varying orientation, lined with tract houses, a veneer of normality that completely fails to conceal the bizarre. One guy’s inner world is rendered in imitation of the paintings he does. Since his medium is fluorescent paint on black velvet, this makes for the strongest visual shift yet. I think my favorite so far is the inner world of Fred Bonaparte, a classical loonie who thinks he’s Napoleon. Sort of. It’s more like he’s got a split personality and one of those personalities is Napoleon. (Or, heck, maybe he really is possessed by Napoleon’s ghost. It wouldn’t be the weirdest thing in the game.) In his mind, Fred and Napoleon are playing a hex-based wargame, which you can descend into and explore at two different levels of scale, shifting in size as appropriate to interact with the buildings on the map or the wooden soldiers. (Both soldiers and buildings occupy one hex each.) With the size shifts and the conversing with game pieces, it’s kind of like Alice in Wonderland meets Avalon Hill. And, well, the game just looks good. It’s that lush mixture of gameboard and diorama that the really dedicated hobbyists put together, the sort of thing that makes you want to learn the rules just so you’ll be allowed to touch it. I suppose that switching around the look from level to level is really one of the fundamental techniques behind platformers: it’s a way to create variety when the gameplay has limited range. Not that this is much of an issue here. However, I find the collection in Psychonauts easier to follow, and I think it’s mainly because the effects are simpler. With the exception of the effects mentioned above of the memories and the emotional baggage (which don’t seem to affect gameplay, and can be classed as “extras”), the end result of collection is always the same: increasing your “rank”. Attaining certain ranks grants permission to buy new equipment, or allows you to learn new powers, or enhances the powers you have. By funneling everything through the “rank” concept, the game simplifies the way you can think about gaining access to stuff. I suppose that this is something that RPGs have been doing all along with character levels, but it’s unusual to see a level system that isn’t at all based on gaining experience through combat. Now, getting all the collectibles in everyone’s mental worlds typically involves going through them more than once. Indeed, it’s completely impossible to collect mental cobwebs from the first couple of minds on your first visit, as you don’t yet have access to the necesary equipment. It’s not uncommon in these games for collection to involve repeat visits to completed levels, but it’s usually handled non-diegetically: to use Lego Star Wars as an example again, if you replay the Battle of Hoth level, there’s no sense that you’re creating a story in which the Battle of Hoth was fought more than once. In Psychonauts, however, every visit is taken to be part of the same ongoing story, even if this requires convoluted excuses. So, the first time train with Sasha Nein, his mental defenses spin out of control and he urgently needs your help to restore order, but when you go back, Sasha offers to put you through the same “training course”, explaining that the emergency was a ruse to motivate you. A more extreme example: In the mental landscape of the monster lungfish, it’s Raz who’s the monster, a Godzilla-like building-crumbling behemoth attacking Lungfishopolis. When you complete the level, by destroying a certain broadcast tower (the lungfish’s mental representation of the crainial implants that the bad guys are using to control it), the lungfish of the city are freed from their brainwashing and come to regard you as a hero. On a return visit, you’re cordially greeted by a lungfish who warns you that there are still some crazy guys out there who “don’t realize that the war is over”, and invites you to destroy as many buildings as you want: now that they’re free, they realize that lungfish were meant to live in mucus-lined bubbles at the bottom of lakes, not in tower blocks. These scenes make a virtue of a constraint: they treat an unlikely situation resulting from gameplay decisions as an opportunity for humor. Or possibly the other way around: they use the fact that this is a humorous game as an excuse to integrate gameplay decisions with the story in ways that would be implausible if taken seriously. Whichever way it goes, it’s something that Schafer has been doing since his Lucasarts days. 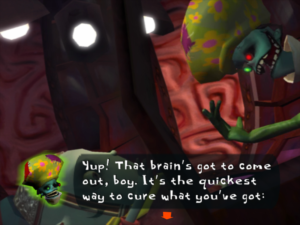 I think I’ve been missing things that the designers of Psychonauts wanted me to see. Early on in the game, Raz is given access to his own mental landscape, his dreamworld. There, he sees a mad doctor in a tower menacing Dogen, one of the other kids at the camp, and threatening to extract his brain. Raz is convinced that this is more than just a dream, that he’s witnessing something real. His default dialogue with other characters changes: he asks them if they know anything about people’s brains being stolen and things like that. But after a while, Raz started saying things that suggested that he had observed changes in Dogen’s behavior that the stolen-brain hypothesis would explain. Thing is, I hadn’t observed these changes. I hadn’t seen Dogen in some time and had no idea where he was. I think I know where he was now: when I finally reached the brain-removal room in Raz’s dreamworld, the one thing that brainless Dogen said was “TV”. There’s a TV room in the main cabin, but I hadn’t visited it lately because there wasn’t much to do there. When I finally got back there (after a long diversion involving a monster lungfish), it was empty, and Raz said something along the lines of “Finally, no one is here! I can watch whatever I want!” Now, I had never seen anyone else in the TV room, and no one had ever objected to my changing the channel. So it really seems like I was supposed to have gone back there and seen Dogen, and possibly other debrained children, watching TV and drooling or something. If I’m right about all this, and I’ve been breaking the sense of the story by not doing things in the right order, it’s kind of surprising: Tim Schafer comes from adventure games, and keeping the plot sensible regardless of player choices is a big part of adventure game design. But here I am, circumventing important plot points without trying. In fact, I’ve been at some pains to cooperate with the designers and do what they want me to do. That may in fact be my problem, because the game sends mixed messages. On the one hand, Raz seems to regard the rescue of Dogen in the dream tower to be his top priority, and urgent to boot. It’s a false urgency, because the the game has no real time limits, but it seemed like a sign that this was what I was supposed to focus on next in order to keep the game going the way the designers intended. On the other hand, each step in the plot also changes all the incedental stuff: the kids are all in new places doing new things and have new dialogue, the bulletin boards have new notices, etc. (I didn’t even notice that the boards were readable at first, so I missed a couple of chapters worth of notices.) Most of this is just humor not related to the main story — there’s a fairly complicated pre-teen soap opera going on if you feel like paying attention to it — but some of it’s important to Raz’s investigations, and you’ll miss most of it if you actually go directly where Raz tells you to go instead of wandering around and visiting every location again every time you exit a dreamworld. I suppose I thought I’d always have the opportunity to stumble across relevant scenes involving the other kids on the campground, but at the point I’ve reached in the game, all the other kids are gone. I may replay from the start at some point just to get a more thorough look at everything, maybe after I’ve finished the game and can understand all the foreshadowing. It’s an enjoyable game to play, and this would also allow me to see the earlier scenes at their intended framerate.